The Entertainment Software Association has won a preliminary injunction against the Chicago Transit Authority in its lawsuit over the CTA's prohibition of ads for M and AO-rated videogames. 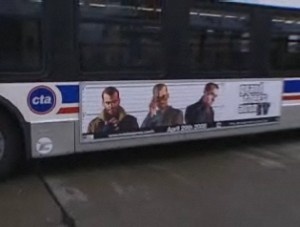 Trouble between the ESA and the CTA began back in April 2008, when the Transit Authority pulled ads for Grand Theft Auto IV from its buses and buildings in response to a Fox News report suggesting they were somehow responsible for a rise in criminal behavior in the city. Take-Two sued and won, forcing the return of the ads; the CTA followed that up by implementing new regulations in January 2009 that banned all advertisements of Mature and Adult Only videogames on CTA property. That decision led the ESA to sue again in July 2009, saying that the videogame industry was being unfairly targeted because the restrictions apply only to games and not other forms of media. "Courts across the United States, including those in the CTA's own backyard, have ruled consistently that video games are entitled to the same First Amendment protections as other forms of entertainment," ESA Chief Executive Michael Gallagher said at the time. "The CTA appears unwilling to recognize this established fact, and has shown a remarkable ignorance of the dynamism, creativity and expressive nature of computer and video games." Today, the ESA came out on top in the first round of that lawsuit, winning a preliminary injunction against the Transit Authority. The court ruled that the ESA is "likely to succeed on the merits of [its] claims at trial" and therefore blocked the enforcement of the CTA's restriction until the case is resolved. "The advertisements the CTA wishes to ban promote expression that has constitutional value and implicates core First Amendment concerns," Judge Rebecca R. Pallmeyer said in her decision. "This ruling is a win for Chicago's citizens, the video game industry and, above all, the First Amendment," Gallagher said. "It is our hope that the CTA sees the futility of pursuing this case further. To do so will waste taxpayer money and government resources. Chicago deserves better and we look forward to bringing this matter to an end." The ball is now in the CTA's court, said ESA Senior Director of Communication Dan Hewitt. "Right now, it's up to the CTA to determine whether they want to push forward," he said. "We'd rather the CTA see that this was a futile effort and stop pursuing this."